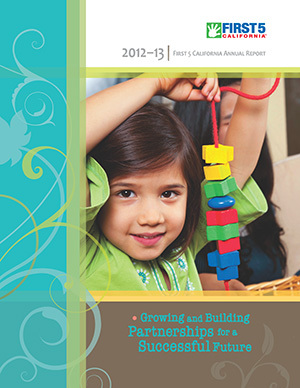 Additional County Annual Reporting Resources may be found on our First 5 Partner Annual Report Page. 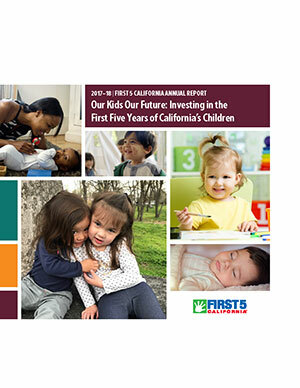 First 5 California’s 2014 Strategic Plan was adopted as a five-year plan. The Strategic Plan consists of First 5 California’s: 1) Vision, 2) Mission, 3) Values, 4) Strategic Priority Areas (SPAs), and 5) Goals. These key elements provide an overarching frame for What First 5 California wants to accomplish and Why. There are no funding opportunities available at this time. The Audit Guidelines provide guidance and assistance to county commissions and their auditors regarding the format required for the annual fiscal audit. George Halvorson was appointed by Governor Jerry Brown to chair the First 5 California Children and Families Commission in May 2013. He also is the chair and chief executive officer (CEO) of the Institute for InterGroup Understanding. In this role, Halvorson is focused on putting processes, teaching materials, and learning programs and approaches in place to help people deal with issues of racism, discrimination, intergroup anger, and intergroup conflict. He currently is authoring three new books that will serve as the core teaching curriculum for the Institute. Prior to taking on his new roles focusing on children and intergroup conflict, Halvorson served for more than 11 years as the chair and CEO of Kaiser Permanente, retiring from that position at the end of 2013. Prior to his tenure at Kaiser, he was the president and CEO for Health Partners in Minnesota, serving in that position for 17 years. Earlier in his career, Halvorson started health plans in Uganda and Jamaica, and helped start health plans in Chile, Spain, and Nigeria - most of which continue to operate. He has advised governments in Great Britain, Ireland, Germany, Saudi Arabia, New Zealand, the Netherlands, and Russia on health care issues and has been featured as an educator for national health ministries at the European Union Health Summit in Brussels. Halvorson has authored eight health care-related books, including Strong Medicine; Epidemic of Care; Building Health Co-ops in Uganda; and Ending Racial, Ethnic, and Cultural Disparities in Health Care. Additionally, he has served on more than 30 boards and commissions, and has chaired more than a dozen - including the American Association of Health Plans; the International Federation of Health Plans; the Partners for Quality Care Board; the Health Governors for the World Economic Forum in Davros, Switzerland; and the Health Plans Committee for the Board of the American Diabetes Association. He and his wife, Lorie, have five sons, two daughters-in-law, and five grandchildren. While they reside in the San Francisco area, they continue to have strong ties in Minnesota. Joyce Iseri has over three decades of experience in health and human service issues in the public and private sectors. She currently is a consultant for Capitol Academy 120, a program for local elected officials sponsored by the California Asian Pacific Islander Legislative Caucus Institute. From 2002 to 2004, Iseri was chief deputy director of the Managed Risk Medical Insurance Board, a state agency that provides health coverage to uninsured Californians. Prior to that, she was the principal consultant for health and human services for the Assembly Appropriations Committee under Chairs Carole Migden and Darrell Steinberg. Her 14 years of legislative experience also includes serving as consultant with the Senate Health and Human Services Committee and the Assembly Office of Research. In addition, she has held managerial positions in the California Departments of Social Services and Corrections, as well as serving as Executive Director of a foster care provider association for seven years. Iseri holds a B.A. in economics from the University of Wisconsin and has done graduate work in economics at the University of Hawaii and UCLA. Her community activities include serving on the board of the Asian Pacific Youth Leadership Project. Conway Collis is President and CEO of GRACE (Gather, Respect, Advocate, Change and Engage), a non-profit organization that seeks to fulfill the mission of the Daughters of Charity by making a positive difference in the lives of low-income families and their children. Collis has been a public servant and advocate for social change for more than four decades. Following graduation from Occidental College and Stanford Law School, he was a committee counsel on the U.S. Senate Labor and Public Welfare Committee and domestic policy advisor to U.S. Sen. Alan Cranston, advising on federal domestic policy issues including poverty, healthcare and social and legal services. Prior to law school he worked in a state mental hospital, as a live in counselor for delinquent boys and in the Upward Bound program. Collis was elected to the California State Board of Equalization, California's governing tax and revenue agency, in 1982. Re-elected in 1986, he served as Chairman of the Equalization Board, an agency with over 1500 employees in 57 offices. He wrote and sponsored the State Taxpayers' Bill of Rights, tax credits for employer-sponsored childcare, and the elimination of tax benefits for discriminatory private clubs. In 2001, he served as Chairman of the California State Senate Bipartisan Task Force on Homelessness. From 2005-2012 Collis served as Senior Counselor and Chief Public Policy Officer for the Daughters of Charity Health System (DCHS). On behalf of DCHS Collis initiated and proposed California's Hospital Provider Fee, and helped lead its state enactment and federal approval. The new law will have generated $9 billion for health care for low-income Californians and over $1 billion for children's health care through FY 2013. He also initiated and led the development and passage of Measure A, a San Mateo County sales tax increase sponsored by DCHS expected to provide $600 million for crucial County services including $150 million to Seton Medical Center over the next ten years. Prior to joining DCHS in 2005, he was president of Collis Associates which provided public policy counsel to public and private sector clients working in the public interest. Collis is a member of the California State Commission on Children and Families (the state First 5 Commission), chairs the Development Committee of the board of Kids in Sports and is the founding board chair of the National Foster Youth Institute. Dr. Muntu Davis is currently the Public Health Department Director and County Health Officer in Alameda County, California. He advises the County Board of Supervisors, local government agencies, and community members and organizations on medical and public health issues and on the development and implementation of public health policy and practices. He also provides oversight, strategic direction, and fiscal management of the department and all of its divisions. He joined the ACPHD in October 2005. Prior to working Alameda County, he worked in the Immunization Branch of the California Department of Health Services on pandemic planning and education on febrile rash evaluation. He also practiced medicine in urban and rural primary care and urgent care clinics in Northern and Southern California. He held multiple positions at the Continuity of Instruction to Reinforce Our Children's Learning Environment (C.I.R.C.L.E.) program at the Tom Bradley Elementary School including co-director and member of the board of directors. Dr. Davis received both his Bachelor of Arts in Spanish and his medical degree from the University of California, Los Angeles, and completed a residency in Family Medicine at Presbyterian Intercommunity Hospital in Whittier, California. He completed The California Endowment Scholars in Health Policy Fellowship and received his Master of Public Health degree from Harvard School of Public Health in Boston, Massachusetts, where he analyzed policies regarding emergency response planning, implementation, evaluation, and modification at the county level in California. His other areas of interest include ways to improve the use of television news, newspapers, and education-entertainment to promote health and community dialogue regarding both health issues and health policy. In her role as Director of Early Care and Education at Fresno County Office of Education, Lupe Jaime oversees several early learning programs and initiatives, including the Child Care and Development Local Planning Council (LPC); the Early Stars Quality Rating and Improvement System; the Race to the Top – Early Challenge Grant; the California State Preschool Program Block Grant; the Teen Parent Support Program; and Early Care and Education Workforce Support programs, such as PIECES and the California Transitional Kindergarten Stipend Program. Prior to her current position, Ms. Jaime was the Deputy Director of Central Valley Children’s Services Network. In this role, she managed the Resource & Referral, Subsidized Childcare, and numerous First 5 Fresno County contracts. In addition, she served as an Infant & Toddler Specialist Trainer for WestEd, and a Child Development adjunct instructor at Willow International College. She is actively involved in her community and currently serves as a member of the Fresno County Child Care & Development LPC, co-chair of the California State University, and the Fresno Central Valley Bilingual Dual Language Consortium. 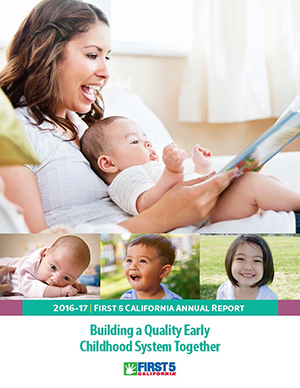 She is a Board Member for the California Childcare Resources and the California Child Development Administrators Association. Ms. Jaime holds a Bachelor’s degree in Liberal Studies and a Professional Clear Multiple-Subject Teaching Credential. In addition, she earned a Master’s degree in Cross Cultural Education and a Child Development Director’s Permit. Recently, she earned a post graduate certificate in Infant Family Mental Health from the University of Massachusetts, Boston. Most importantly, Lupe is the proud mother of a 19-year-old daughter, Alexus, who currently is attending University of California, Merced. Shana Hazan is a community leader, educator, and the proud parent of a young daughter. Shana serves as the Senior Director of Resource Development at Jewish Family Service of San Diego, a comprehensive human service organization that delivers client-centered, impact-driven services that empower individuals and families to achieve self-sufficiency, and supports aging with dignity. In this role, she oversees the agency’s institutional and individual fund development, government relations, and public policy work. Shana designed and secured funding for the Linda Vista Kindergarten Readiness Network, which utilizes a collective impact model to address barriers to kindergarten readiness, as well as funding for the Hunger Advocacy Network, an innovative initiative consisting of social service agencies, anti-hunger organizations, and nutrition advocacy organizations that collaborate to advocate for state policies that increase food security. Shana currently serves on the City of San Diego’s Human Relations Commission, and on the boards of CORE Educational Services; the Foothold Foundation; and Stanley E. Foster School of Engineering, Innovation, and Design. Previously, she developed Jewish Family Service’s nationally recognized model for youth leadership through service learning. She also has worked for ABC News in London, taught elementary school in Chicago Public Schools, and served as Safe Routes to School Director for Active Transportation Alliance. Shana holds a Master’s Degree in Education and Social Policy from Northwestern University. In 2016, she was recognized by Assembly Speaker Atkins as a 78th Assembly District Woman of the Year. In December 2012, Camille Maben began serving in her current role as Executive Director of First 5 California. In that role, she is responsible for staffing the California Children and Families Commission, in addition to directing the work of the agency and its staff. 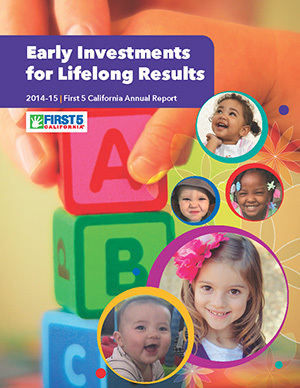 Through her leadership, First 5 California is implementing several evidence-based and results-driven Signature Programs targeted to children, parents, and teachers that focus on quality. 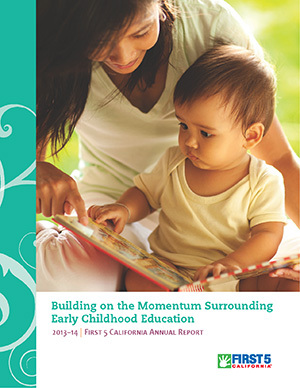 Prior to her appointment at First 5 California, Camille served as the Division Director of the Child Development Division at the California Department of Education (CDE). Part of her responsibilities in that role included providing leadership and oversight to over 700 early care and education contractors with a $1.7 billion dollar budget. She most recently served as Co-Chair of the State Advisory Council on Early Learning and Care, and also helped win and implement the $52.6 million federal Race to the Top  Early Learning Challenge Grant. She was previously appointed by the Governor to serve as Chief of Staff for the Office of the Secretary of Education. She worked closely with the Secretary on the coordination and development of the Governor's education policy agenda. In earlier work at CDE, Camille served as Division Director of the School and District Accountability Division. 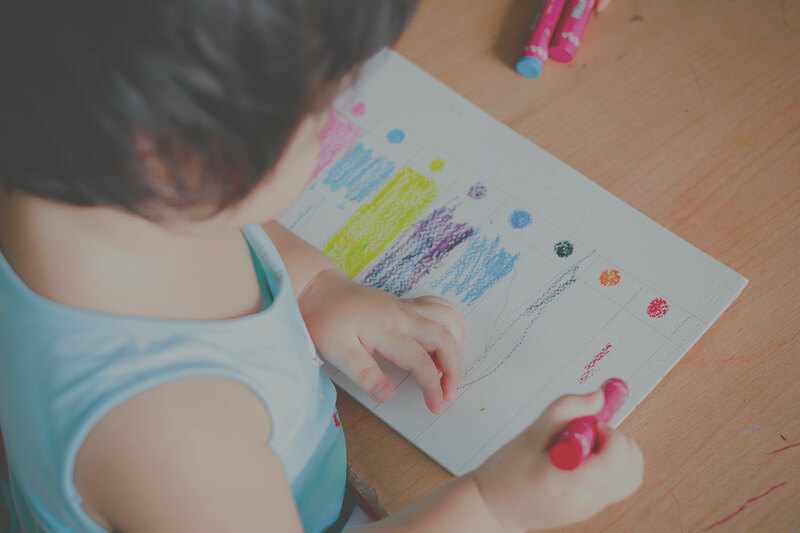 Her division included the No Child Left Behind Office, oversight of the Categorical Program Monitoring process, the Title I Policy and Partnerships Unit, and the English Learner Accountability Unit. She served as the Superintendent's representative to the California Interscholastic Federation. Camille also served as Senior Advisor to former State Superintendent Delaine Eastin and has worked as a consultant to the Assembly Education Committee. Camille currently serves as a school board member for the Rocklin Unified School District. She has served on the Rocklin Board for over 20 years. Diane Levin joined First 5 California in 2008 and serves as the agency's Chief Deputy Director. In addition to directing the agency's day-to-day operations, her primary responsibilities include establishing and implementing internal policies that provide for the governance of the agency's policies, programs, systems, services, security, and public relations. Prior to her appointment as Chief Deputy Director, she served as an ex officio member of the First 5 California State Commission representing the Governor's Office of the Secretary of Education (OSE). In early 2007, Diane Levin was appointed by Governor Arnold Schwarzenegger to serve as Policy Director for OSE. In that role, her work included leading and coordinating the development of the Governor's education policy agenda. Prior to her OSE appointment, Diane worked in the California Department of Education (CDE), where she was the Administrator of the No Child Left Behind Implementation Office, where her responsibilities included coordination of NCLB efforts throughout the Department and with school districts, in addition to the development and oversight of the Department's Categorical Program Monitoring (CPM) process. Before that, she worked in the Superintendent's Executive Office at CDE during both the O'Connell and Eastin administrations. For most of her tenure at CDE, she served as a language arts consultant and was one of the authors of the 1999 Reading-Language Arts Framework. Diane is a credentialed teacher and completed her graduate work in the area of Reading instruction. Frank S. Furtek is First 5 California's Chief Counsel. Frank has devoted his 30 year legal career in public service to working in the health and human services arena. Frank joined the Solano County Counsel's Office in 1985, representing the county in dependency and child welfare matters. Frank spent 18 years at the California Attorney General's Office, working exclusively for the Health, Education and Welfare Section. He litigated numerous cases in state and federal trial and appellate courts; his legal highlight was appearing before the United States Supreme Court when the Department of Social Services was challenged for imposing durational residency requirements on prospective welfare recipients. In 2004, Frank was tapped to serve as the Chief Counsel for the California Health and Human Services Agency, and was responsible for the coordination of legal services for the 13 state departments, boards, and offices under the Agency's purview, including the Departments of Health Care Services, Mental Health, and Social Services. In 2009, he worked for a year and a half at the California Department of Social Services as its Chief Counsel. Frank started at First 5 California in 2013. Frank holds BA degrees from the University of California at Davis in Political Science/Public Service and Economics, and a JD degree from the University of the Pacific, McGeorge School of Law. He and his wife have three children. David Dodds is Deputy Director of Evaluation, a position to which he brings years of experience as a researcher in state government. At the California Department of Public Health, he served as lead research scientist on evaluation teams for the Black Infant Health Program and Adolescent Family Life Program as well as vital statistics analysis. 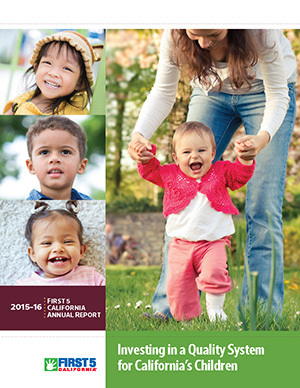 Prior work in state government included developing child welfare outcome measures at the California Department of Social Services and analysis of immigration and tabulation of race/ethnicity census data at the California Department of Finance. David holds a PhD in Anthropology from UCLA and a Master of Public Health from UC Berkeley. Additional studies included a Mellon Postdoctoral Fellowship in Demography at UC Berkeley. As an anthropologist, he has worked in multiple countries in Latin America. Erin Gabel is the Deputy Director of the External and Governmental Affairs Office, where she is responsible for the Commission's legislative and public affairs initiatives. Prior to joining the First 5 California team, Erin was the education consultant for California State Senate President pro Tempore, Darrell Steinberg, and advised the pro Tem and Senate on a wide range of education reform issues that included preschool and early learning, kindergarten through grade 12 public education, and higher education. Before joining Senator Steinberg's policy team, Erin was the Director of Government Affairs Division at the California Department of Education. Erin was responsible for the Department's involvement in all state and federal budget and legislative processes. She served State Superintendent of Public Instruction Tom Torlakson as a policy advisor under different hats in the Department, Assembly, and the Senate over an eleven year tenure. Prior to working at the state Capitol, Erin served as Deputy Chief of Staff to Contra Costa County Supervisor John Gioia. Erin was one of the founding staff members of the Partnership for Children and Youth as their first Children Nutrition Project Director, and now serves on its Board of Directors. Erin is a graduate of the University of California, Berkeley, and the proud mother of two young and active boys, August and Rhys. Jaime Hastings is First 5 California's Director of Administrative Services. In this role, Jaime is responsible for coordinating key administrative projects, such as the State Commission meetings; Annual Report production; development/updating of agency policies; annual Child Health, Education and Care Summit coordination; and human resource processes. Jaime was previously First 5 California’s Office Manager. Prior to coming to First 5 California, Jaime served in a variety of roles at the Department of Education (CDE) for over 12 years. She mostly recently served as an analyst in the Child Development Division and assisted the director in managing the daily operations; she worked on several projects, including the Race to the Top – Early Learning Challenge Grant and the State Advisory Council on Early Learning and Care. Prior to that, she served as the CDE's State Board of Education (SBE) Liaison, where she coordinated and reviewed SBE Information and Agenda Items; served as the point person in negotiating the content of items between CDE and SBE staff; and coordinated briefings for the Chief Deputy and Superintendent of Public Instruction. In her early years at the CDE, Jaime provided assistance in several capacities in the Office of the State Superintendent; and Data Management, Personnel Services, and School and District Accountability Divisions. Jaime and her husband, Brad, are the proud parents of Anthony and Samantha. Sierra Losh is the Director of Fiscal Services, where she is responsible for the Commissions budgetary and accounting functions. Prior to joining First 5 California, Sierra was the Budget Officer for the State Controllers Office where she managed a $200 million budget and successfully advocated to fund the Controllers fiscal oversight and objectives. Before the State Controllers Office, Sierra spent several years with the California Teachers Retirement System researching the Teachers Retirement Law to determine the outcome of complex retirement payout issues. Sierra also worked at the Del Oro Caregiver Resource center where she was responsible for all accounting functions, financial reporting, and providing support in submission of grants to state and local entities. Sierra holds bachelor of art degrees from the University of California, Davis in Sociology and Art. Kellie Westley is the Director of First 5 California's Contracts and Procurement Office. She manages the agency's annual $227 million contracts from local entity agreements to large competitively bid solicitations. She had ten years of administrative state and ten years of administrative California school district service before taking her current position with First 5 California in July 2012. Kellie is a fifth-generation Sacramentan and holds a B.A. from Western Washington University's College of Business and Economics.